The Trump administration, which has already caught the backlash of farmers suffering through the U.S.-China trade war, just made another move that could be seen as the latest hit against soybeans. The U.S. Commerce Department is starting a review of the anti-dumping and countervailing duties it placed on shipments of Argentine biodiesel earlier this year. The original decision was applauded by the American industry, a major consumer of soybeans. If the fees are repealed, that could mean a dent in demand for U.S. supplies of the oilseed. The Trump administration’s decision comes amid “changed circumstances” for the Argentine industry, a Nov. 7 Commerce Department filing said. The South American nation asked for the review after it added a 15 percent domestic tax for its exports of biodiesel and reduced taxes on soybean products. Argentina, the world’s top shipper of soy meal and oil, said that the Trump tariffs had essentially caused its exports of biodiesel to the U.S. to cease. The trade flow totaled $1.2 billion in 2016. The tariff review could add to the building tension between Donald Trump and his vaunted rural American base. Soybean farmers have been front-and-center in his trade war with China after the world’s second-largest economy placed retaliatory tariffs on U.S. supplies. 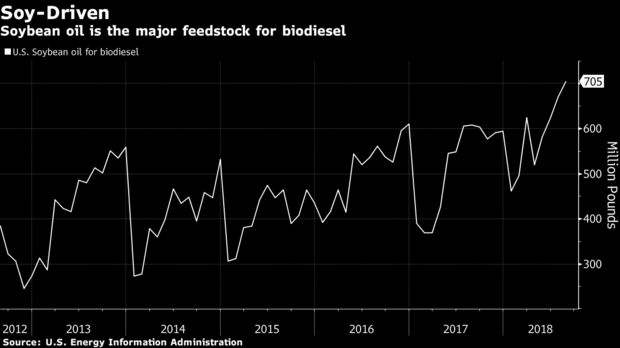 Domestic biodiesel plants, which used a record 705 million pounds of soy oil in August, had become a haven of demand for the crop. “It’s a big deal,” Kurt Kovarik, vice president of federal affairs for the U.S. industry group National Biodiesel Board, said by phone Monday. The review “caught a lot of people by surprise,” he said. The Commerce Department review will be completed within 270 days, according to the filing. Kovarik of the biodiesel group said that it’s “somewhat ironic” that Trump has taken aim at China, sparking reaction that has hurt American farmers, while at the same time revisiting the grower-endorsed trade moves against Argentina. “The collateral damage is again the American soybean farmer,” Kovarik said.